My daughter turned four in May. She finished her first quilt last week and boy is she proud! She pulled the rainbow of fabrics from my stash (because she didn't have a stash at that point, a problem we've since rectified). The girl has an eye. The quilt is about 40" by 50", made up of 10" squares. Like my son, my daughter did all the piecing of her first project sitting on my lap at my machine. I pressed all the seams for her. And by the time we were on the quilting step she was itching and ready to sit at the "kids" machine (same model, on a kid sized table) to do the quilting by herself. She still needed help with her walking foot quilting, particularly because she opted for curves when we brainstormed her options. I mostly managed the bulk of the quilt and reminded her when to stop and start to reposition her hands. She's great at stopping to take out the pins. 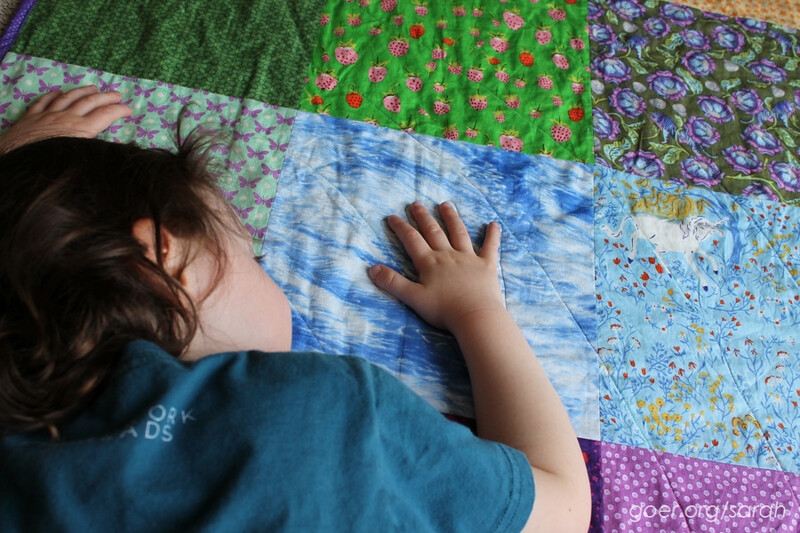 Once she was done, I quilted her life-sized handprint onto the quilt. I love this fun little detail. She hand wrote her quilt label. 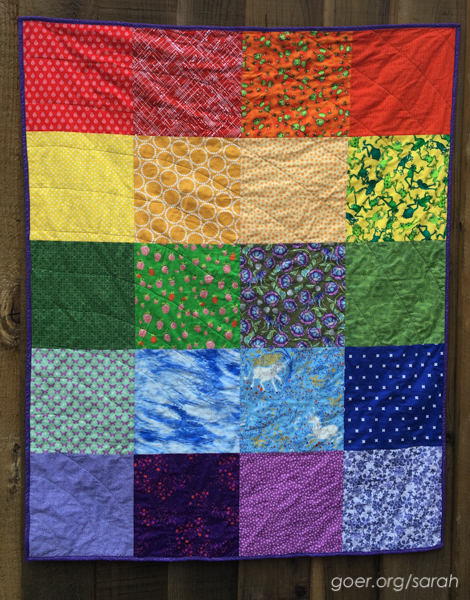 I love that she named the quilt Rainbow Swift 2. 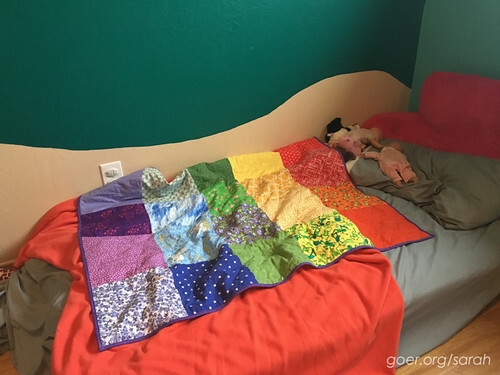 Rainbow Swift is the doll quilt my son made for her. The label is GIANT. It was great fun to see her enthusiasm and pride in her work. I'm so happy that I can share my passion with my kids. 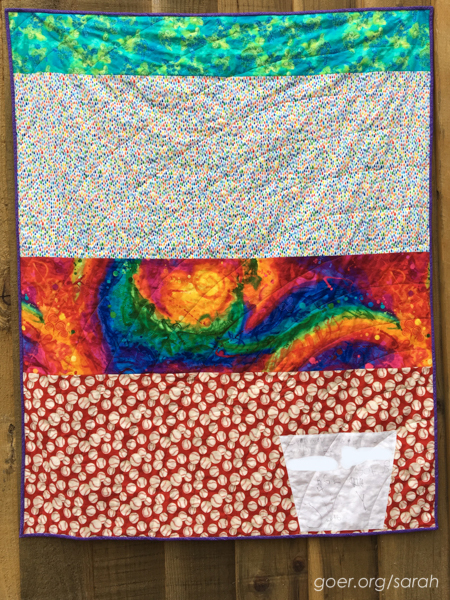 We got it finished (I made and attached the binding) just in time for her to bring it along to my guild meeting last Monday for her first quilt show and tell. She's been sleeping under it every night since. And many morning she even makes her bed! My son handed down a few months ago when he declared, "I'm not in training anymore." Tell me the process of making a quilt. Sew them together. Sew the squares together and then you sew the sandwich together. But first you put pins and pinmoors in. How did you decide on the name “Rainbow Swift 2”? I already had Rainbow Swift and I liked the name. How was it to be taught by your mom? What did you like best about making a quilt? I like that it is big and it can almost fit my bed. What about the process of making it? Sewing it like a rainbow. It looks real like a rainbow because the stitches go curving. [Admires her work.] And it’s rainbow thread. And there’s rainbow raindrops on the back and kind of rainbow curly fabric. What is your favorite part of quilting? My favorite part of quilting is sewing the stuff together. The hardest part was curving it [while quilting] because I had to press harder with this hand to make it curve that way. What’s the most important thing to know to make a quilt? To know not to go too fast and take out pins when you need to. What would you tell a new quilter? To do that same thing. 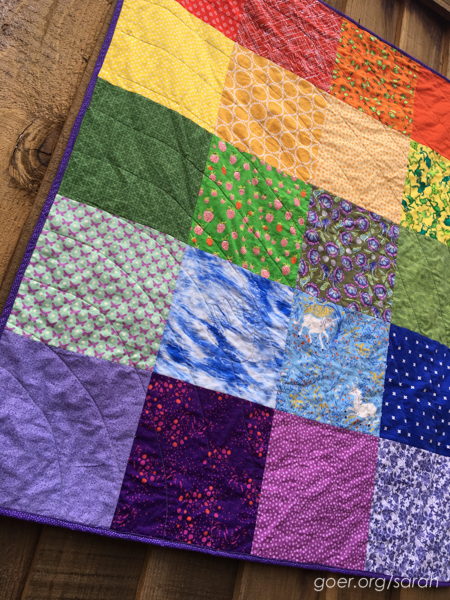 Will you submit your quilt to the next SCVQA quilt show? What are your plans for “Rainbow Swift 2“ now that it is done? To cuddle with it and sleep with it. What are you planning for your next quilt project? Yes. I like sewing and I wish I could sew every day like Mom. I'm linking up to Needle and Thread Thursday, TGIFF and Finish it Friday, as well as the Q3 Finish Along finishes party. See all my Q3 WIPs in my goal post. Posted in Quilting. 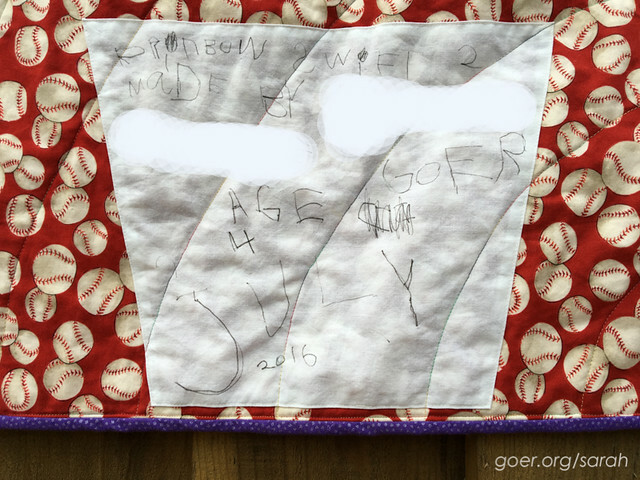 Tags: finished quilt, quilting with kids on September 2, 2016 by sarah. This is a wonderful post Sarah. I especially like the interview with the quilter. It's a great little quilt and it is giving me ideas for very simple donation quilts. 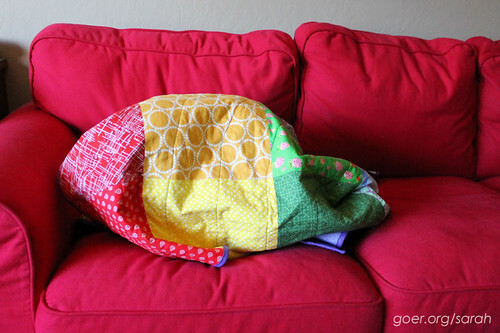 I love the photos of your daughter using the quilt as well. My kids were teenagers when I started quilting so absolutely zero interest in making them although they do like receiving them. Thank you, Lisa. 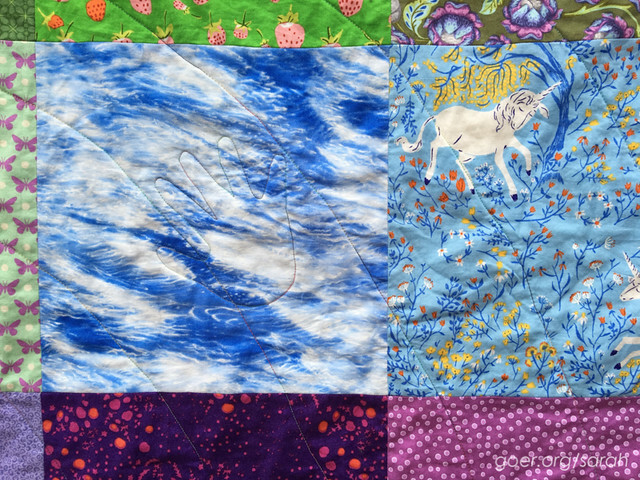 There are so many simple, but striking options for donation quilts. Glad her design is an inspiration! I hope my kids continue to be interested in sewing and quilting, but at least they are learning lifelong skills. Good job, R. Grandma is very proud of you. Just wonderful on every way. You are a fabulous mom!! Love love love this! Congrats to all of you. I think I could use some lessons from her! What a great post! I taught handwork for many years to kids in a Waldorf School and it was a wonderful experience for me, getting to see them so excited about making something with their own hands. 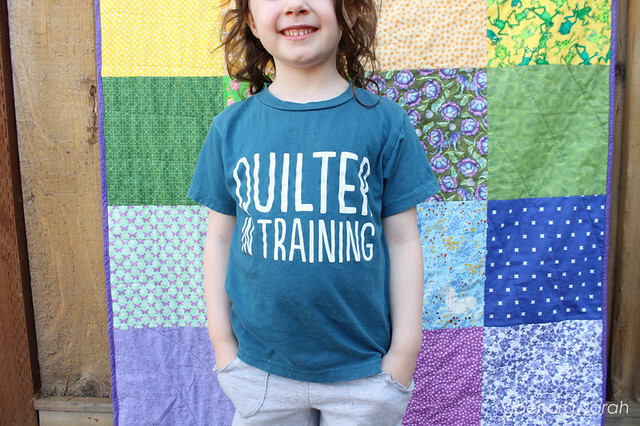 I love hearing that you're passing on the love of quilting to your own children. And I really love your idea of quilting your daughter's hand print on to her quilt! Thanks, Laura. My kids are at a Montessori, so it was my son's hand sewing in class that led me to ask if he wanted to make a quilt (he was 4 1/2). I think my daughter (then 2 1/2) has been waiting since then for her chance to use the sewing machine. For my sanity, I made her wait until she turned 4. Last school year I made quilts with the Kindergarteners in both classes. It was so fun to see them all (ok, most) get excited about the project. The hand print idea came from a friend who commented on one of my early posts about my son sewing. I love it! Oh my! Adorable Sarah. "R" definitely has it in her. Cutie pie❤️. Way to go sweetie. I am so proud to have been a part of your learning👍. She was so lucky to have you as a teacher. I'll pass on your comments to her. Thank you, Sangeetha. aaww...what a sweet article...It is so great that both of your children share your passion. Love the hand print!! This is the cutest post ever. Seriously. The handprint couldn't be more perfect. Love the interview. She must be SO proud. Well done, both of you! Fabulous quilt, such great life lessons when making a quilt...take it slow and enjoy...its a bit like parenthood. Well done quilt makers and story tellers. Indeed. When sewing with the kids, if either of us get too frustrated we take a break. And there's no deadline, so we only work on a project when he/she wants to. Just like many of my WIPs, it'll get done when it gets done. Thank you for visiting, Sue. Oh I love it! Clever girl - I bet she has half an eye on your stash now! I'm pretty happy to share my stash. My son's twin sized quilt that he has in progress is all from my stash and none from his own. There are certain fabrics I steer them away from, but I have plenty to share! :-) Thanks for visiting, Carie. What a lovely blog post. Your little girl is so proud of her hard work, as well she should be! And I love the new quilter's interview - priceless! Thank you, Jenny. She quite enjoyed being interviewed. I left out the part where at the end of most answers she said, "okay, next question" or "that's it." lol. Congrats on her first quilt! Just precious...and I loved the interview! So precious!! 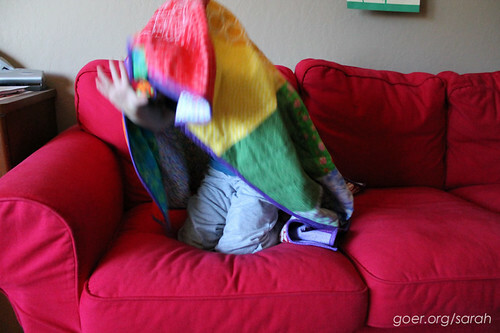 I just love your posts about quilting with your children. I love their enthusiasm, creativity and joy they get from their quilting sessions. I am so lucky to see the quilts in person and witness the pride when they participate in show and tell. Thank you for sharing your passion of quilting. Thank you so much, Mel. They are always to excited to see you and to hear about your projects. Thank you for being part of their quilting world. Great work, little sis! 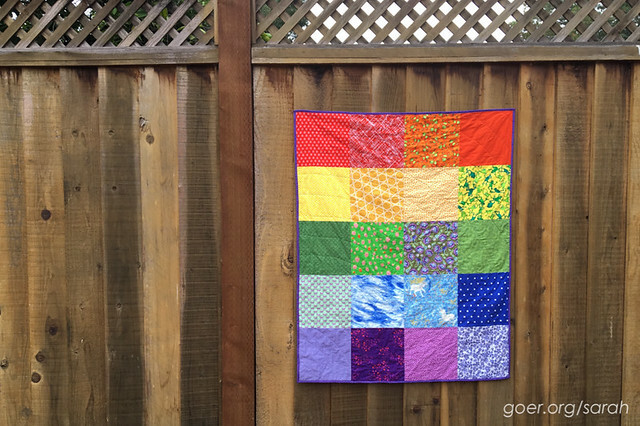 Your quilt is soooo pretty and I love all the rainbows! I will pass along your message. Thank you, Louanne! Love the quilt .. and even more, I love "the interview" !! Thank you, Karen. Interviewing kids is so fun. I have a list of questions that I use for an annual birthday interview. Some of the answers are so priceless! Your post is so heartwarming! I love teaching my grandbabies how to sew! Their interest level changes, but we're having fun! Isn't it great to share our passion with the kiddos in our lives! Thank you for such an encouraging post! Thanks for visiting, Patricia. I'm so glad you enjoyed the post. I find that if I meet them where they are at and listen to what they are excited about, we have a great time working together on a project. There's no deadline, so they can choose to work on their project when they'd like. Have fun with your grandkids. There are so many great sewing projects for kids. Check out the Quilt Cadets patterns from Latifah Saafir. OMG the interview with your daughter is awesome! She did such a great job with her quilt. 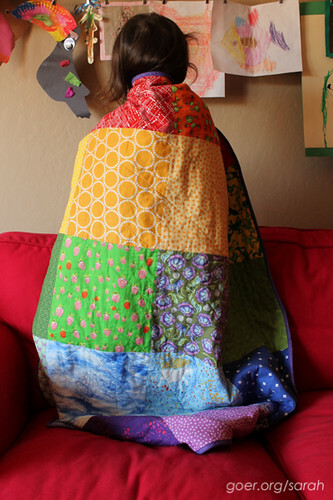 I think you have a lifelong quilting buddy there. So glad you linked up with TGIFF! Thank you, M-R! I love interviewing the kids. I do an annual birthday interview and it's fun to see how their answers change from year to year. And there are always some "gem" answers. ;-) Thank you for hosting TGIFF! 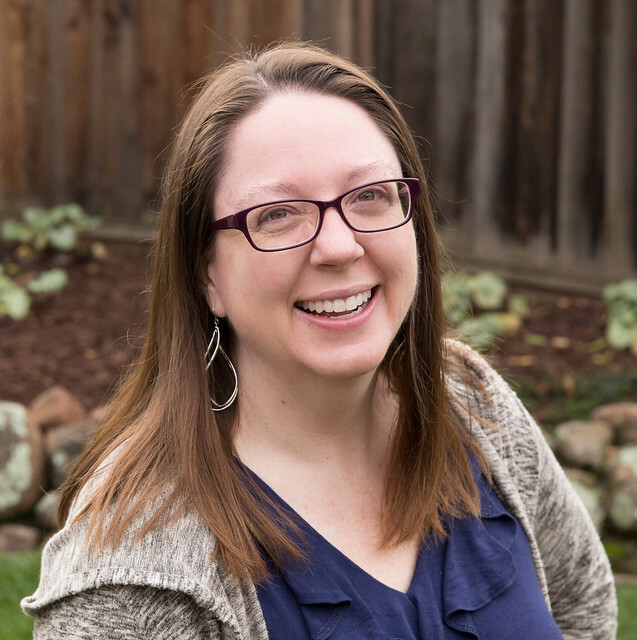 This is the most wonderful blog post I have ever read! Such precious memories and an awesome experience for you and your daughter. I loved the interview too and the quilt....of course. Thank you so much for sharing. Aww, you are so sweet. Thank you so much for visiting, Caryl. This is so great! I remember reading the series when your son first made a quilt. I was just starting to dream about when I could sew with my son. If your daughter can do it at 4, we might be there soon! I have had him help me pick out I Spy squares for quilts before. I love how much your kids seem to enjoy it. What a great project! Thank you, Emily. My best advice is to work in small chunks of sewing time, and to take a break whenever either of you is frustrated. I love that your son has helped to pick fabrics. That's how it started for my daughter. Then she was hooked. ;-) How old is your son? Thank you, Jennie. I'm so glad that they enjoy sewing with me. I really enjoy sharing my passion with them.